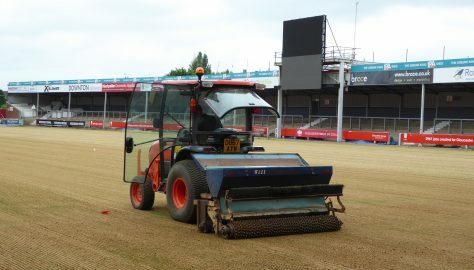 The first step of removing the layer of turf started around 4pm on Tuesday 8 May 2018. 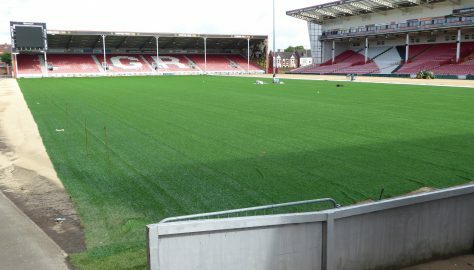 The first match on the new pitch was played on 23 August 2018. 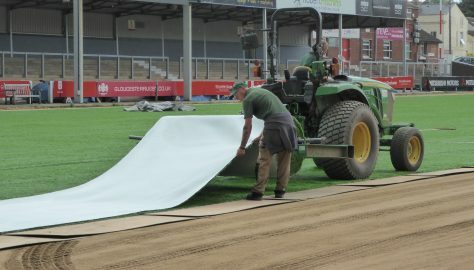 Day 2 - Wednesday 9 May - Turf goes and GPS is prepared. 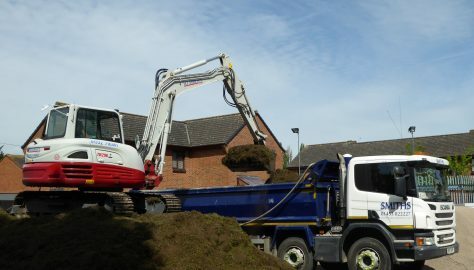 An estimated 200 tons of soil and grass clippings need to be removed from site. 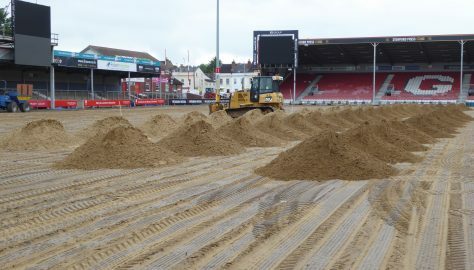 All day was spent bulldozing the soil to start creating the required profile of the new pitch. 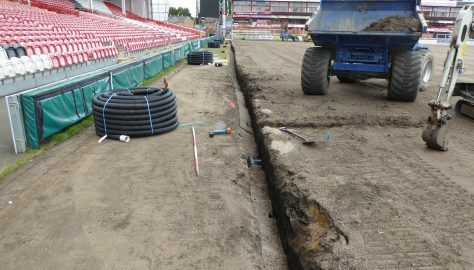 The new drainage system is started whilst creating the new profile of the pitch continues. 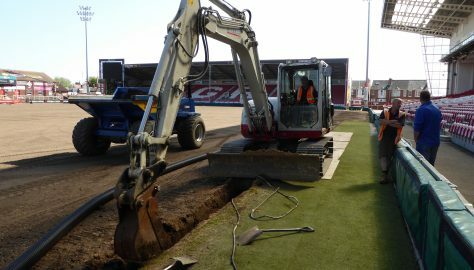 Laying the main drainage pipe begins. 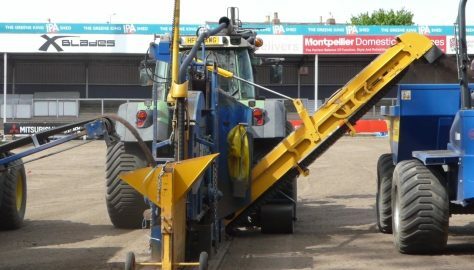 A detailed look at a piece of specialist equipment. 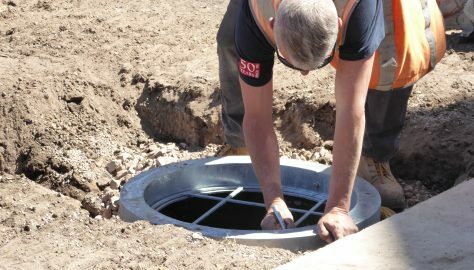 Lateral drains completed. 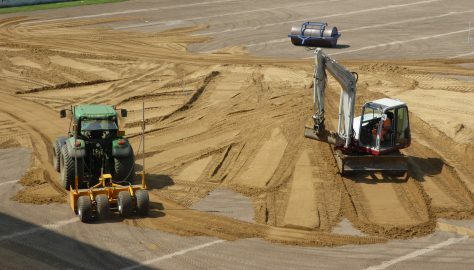 Laying sand started. 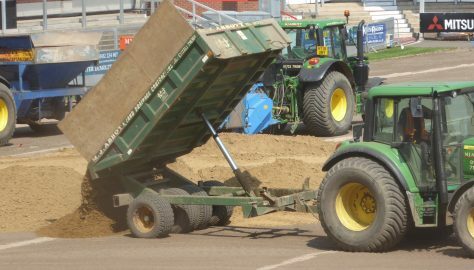 Moving sand from the car parks onto the pitch area. 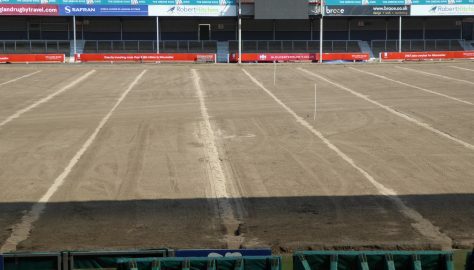 The pitch area is covered with the first layer of sand. 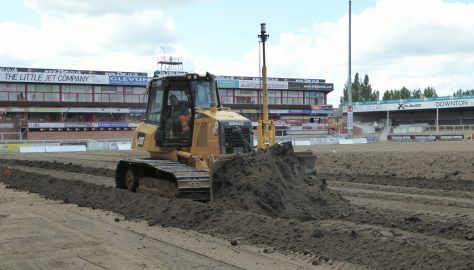 Following heavy overnight rain the surface of the working areas have become quite muddy. 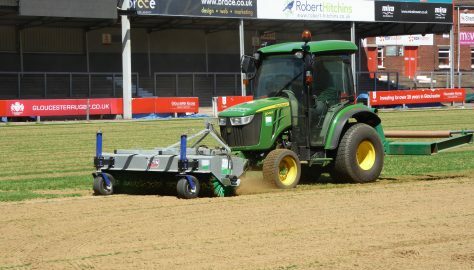 We re-join the action following the Bank Holiday weekend. 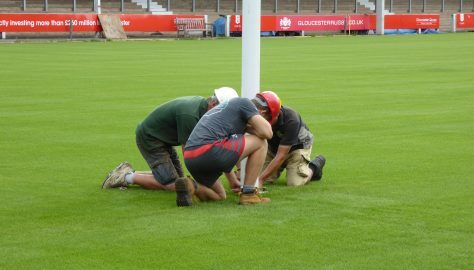 Day 25 - Friday 1 June - Extending the mat across the pitch. 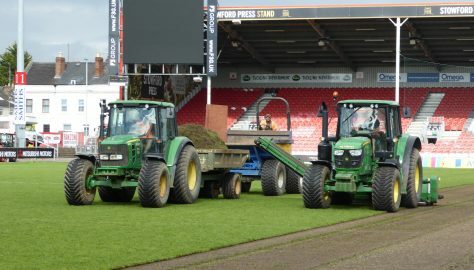 It's Friday and work continues to lay the mat across the pitch. But images can be deceptive. 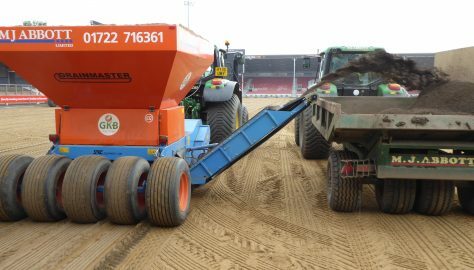 Although the mat doesn't yet cover the full width of the pitch it's time to start adding the sand. 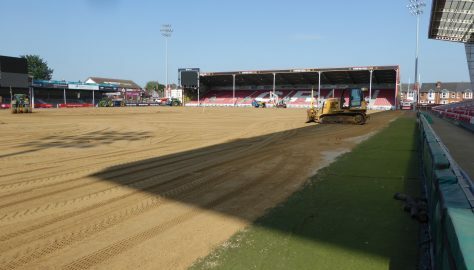 The mat has now been laid across the whole pitch and a first layer of sand applied. 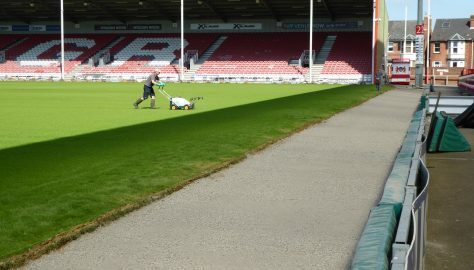 It's taken 32 days to get to the final stage of fertilizing and sewing the grass seed. 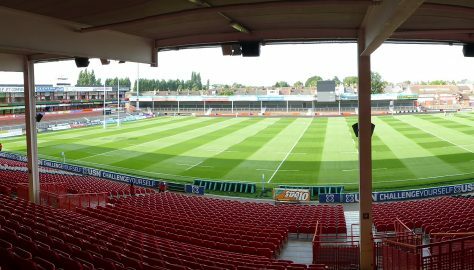 The pitch begins to look green. 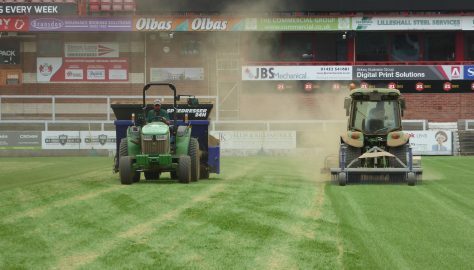 But it's mainly fibres that can be seen. 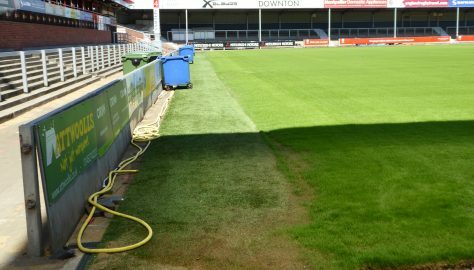 2 weeks after sowing the grass receives its second liquid feed. 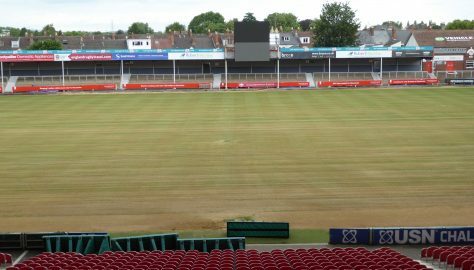 3 weeks after sowing the seed. 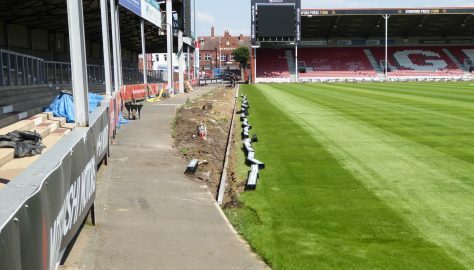 Work begins to tarmac the walkways.